4.5 **** I really enjoyed this novel, I found the world Shona Husk has imagined to be fresh and interesting. The women being able to fly, while the men are grounded, the way family groups and marriages are formed, generally one woman and two men, and the way blood is used and is part of conception. I liked the three main characters a lot and enjoyed uncovering their layers, especially Jarro as he kept so much hidden due to the danger involved in anyone finding out who he really was. The relationship between Jarro and Avin was complicated due to their circumstances, but I really enjoyed discovering the different aspects of it and how the introduction of Halle into their lives changed things for all three of them. The criminal underworld that they are tangled up in is one that takes no prisoners and there were scenes where I was on edge wondering what was going to happen. I can't wait for book 2. Thanks to NetGalley and Ninestar Press for a digital copy in return for an honest review. 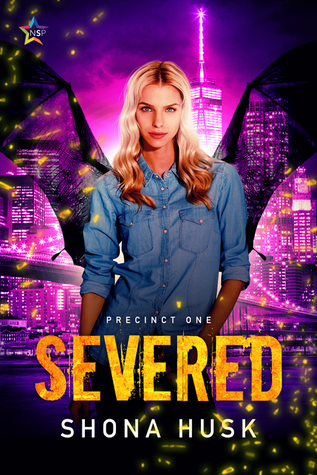 Sign into Goodreads to see if any of your friends have read Severed.